The Falco (English: hawk) is a tactical unmanned aerial vehicle (UAV) designed and produced by Selex ES (now Leonardo formerly Leonardo-Finmeccanica and Finmeccanica, originally by Galileo Avionica of Italy). The UAV is designed to be a medium-altitude, medium-endurance surveillance platform  capable of carrying a range of payloads, including several types of high resolution sensors. A larger variant, the Falco EVO, is capable of carrying larger payloads is also available. Neither system is designed to carry weapons, The launch customer, Pakistan, reportedly wanted the Falco armed, a request that Italy rejected. The Falco UAV's maiden flight took place in December 2003 and Galileo Avionica had completed platform qualification in late October 2004. Over 40 hours of flight-testing had been completed by then at the Salto di Quirra test range in Sardinia. Validation of flight controls had been completed in September 2004. Testing of the onboard systems was planned to be started in early 2005 and integration of the electro-optical sensor suite planned for July 2005. Radar installation was scheduled to begin in 2006. In January 2007 it was reported that Galileo Avionica had finished factory acceptance tests and was ready to deliver the first production Falco UAV System to its launch customer, then believed to be Pakistan. The production version of the Falco UAV used a modified powerplant developing 80 hp (60 kW), supplied by UAV Engines. In March 2009 it was reported that a modified version named Falco Evo, evo meaning evolution, was being offered. It features larger tail booms and wings which almost double wingspan to 12.5 m and increase payload from 70 kg to 100 kg. The Falco Evo's first flight was expected to take place by mid-2010. At the time Selex ES officials refused to identify the customer, but it was known that Pakistan had ordered 5 systems, including a total of 25 Falco UAVs with spare flight units and ground control stations (GCS). Two systems were in service by March 2009, two more had been delivered and the final assembly of the last system was being undertaken in Pakistan. Around September 2009 the first flight of a Falco UAV carrying a high resolution AESA synthetic aperture radar (SAR) sensor payload, called PicoSAR, was made. SELEX Galileo, now Selex ES, announced on 23 July 2012 that the Falcon Evo had successfully completed its 40-minute maiden flight from Cheshnegirovo air base in Bulgaria. In August 2013, the Selex ES Falco was chosen by United Nations to be deployed in the Democratic Republic of Congo to monitor movements of armed groups in the region and to protect the civilian population more effectively. The Falco UAV is 17 feet (5.2 m) long, 6 feet (1.8 m) high, has a 24-foot (7.3 m) wingspan and a top speed of 134 mph (216 km/h). A maximum altitude of around 16,400 feet (5,000 m) and endurance of up to 14 hours can be attained. As well as providing the Falco air vehicle, Selex ES offers a range of sensors, including EOST 46 electro-optical/infrared turret, Gabbiano 20 multi-mode surveillance radar and the PicoSAR radar. The latter is a compact, active "e-scan" radar providing synthetic aperture radar imagery and ground moving target indication. When used in conjunction with change detection software, the PicoSAR can be a powerful counter-IED tool. The Falco can also carry the SAGE electronic warfare suite for accurate direction-finding, classification and geo-location of emitters. The Falco EVO System has a payload capacity of up to 100 kg and an extended endurance of up to 18 hours. In July 2009 according to the French research agency ADIT a deal for a sale of Falco UAVs was awaiting Italian government approval. In November 2009 the Jordanian Armed Forces awarded a contract to SELEX Galileo to develop indigenous UAV technologies and electro-optic sensors for Jordan special operations forces based on the company's Falco tactical unmanned aerial system (TUAS). According to Flightglobal.com, in January 2007 Pakistan became the first Falco export customer. On 13 July 2012 ainonline.com reported a new sale for the Falco, bringing the number of export customers to four, and that more than 50 air vehicles were operational at the time. It has been deployed by Pakistan's military, after the purchase of 24 planes, to the Swat Valley, and a partnership is planned between Selex Galileo partner and the Pakistan Aeronautical Complex, a state-owned defense manufacturer, to produce the Falco in Pakistan. The Falco does not carry armaments and has no strike capability. The U.S. has refused to sell Pakistan its more advanced UAVs over concerns about "sensitive data". The word Falco means hawk in Italian. The Pakistani unarmed Falco UAVs are believed to have been used during the country’s 2009 security operations in the Swat Valley for locating "all kinds of targets," including "ammunition dumps, bunkers, hide-outs, pickets" and other types of infrastructure used by the insurgency. A locally-built drone crash landed at Base near Chak 96 Sargodha. The aircraft suffered minor damages and no one was injured on the ground. Wikimedia Commons has media related to SELEX Galileo Falco. ^ a b c "News Channel - Homepage - flightglobal.com". Flightglobal.com. ^ "Global Air Forces - News and Defence Headlines - Jane's 360". www.janes.com. ^ "Falco EVO - DETTAGLIO - Leonardo - Aerospace, Defence and Security". www.leonardocompany.com. ^ "Complex at Kamra to manufacture drones". Dawn. 21 August 2009. Retrieved 10 August 2014. ^ "PICTURES: Falco Evo UAV makes flight debut". flightglobal.com. 24 July 2012. ^ Michelle Nichols (1 August 2013). "Italian firm to provide surveillance drone for U.N. in Congo". Reuters. ^ "Falco - DETTAGLIO - Leonardo - Aerospace, Defence and Security". www.leonardocompany.com. ^ a b "Falco Gains Mystery Customer as EVO Prepped for Flight". ainonline.com. ^ "Elbit orders Gabbiano radars for Hermes UAVs". flightglobal.com. 29 June 2011. ^ Engelbrecht, Leon. "Falco UAVs for Libya? - defenceWeb". www.defenceweb.co.za. 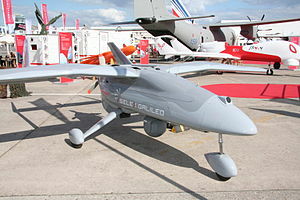 ^ "Selex Galileo targets UK Falco UAV flights, deal with Libya". flightglobal.com. 5 March 2009. ^ "First Galileo Avionica Falco UAV set for delivery, launch customer remains undisclosed". flightglobal.com. 29 January 2007. ^ Mele, Pierluigi (1 December 2014). "L'export armato italiano ai regimi dell'ex URSS Intervista a Giorgio Beretta". Rai News (in Italian). Archived from the original on 2 April 2015. Retrieved 12 May 2018. ^ "Italia: ecco le armi esportate da Berlusconi a dittatori e regimi autoritari". Unimondo (in Italian). 14 May 2012. Archived from the original on 16 May 2012. Retrieved 12 May 2018. ^ Jennings, Gareth (8 May 2018). "Turkmenistan showcased M-346, C-27J aircraft". IHS Jane's 360. London. Archived from the original on 8 May 2018. Retrieved 12 May 2018. ^ "Turkmenistan purchases Italian military aircraft". Chronicles of Turkmenistan. 11 May 2018. Archived from the original on 12 May 2018. Retrieved 12 May 2018. ^ "UN launches unmanned surveillance aircraft to better protect civilians in vast DR Congo". un.org. 3 December 2013. ^ United Nations (3 December 2013). "UN Mission in DR Congo launches the inaugural flight of unarmed Unmanned Aerial Vehicles in Goma" – via YouTube. ^ "Allen McDuffee". www.wired.com. Retrieved 29 March 2018. ^ "The UN Launches Its Own Spy Drone Program". WIRED. Retrieved 29 March 2018. ^ Rodriguez, Alex (9 October 2009). "Pakistan turns to drones of its own". Los Angeles Times. ISSN 0458-3035. Retrieved 29 March 2018 – via LA Times. ^ "Pakistani drone crashes near Sargodha". thenewstribe. 10 August 2014. Retrieved 10 August 2014. ^ "Pakistan drone aircraft crash lands". Zee News. 10 August 2014. Retrieved 10 August 2014.